Few Americans are aware that prisons and jails confine thousands of people whose main offense is that they are too poor. 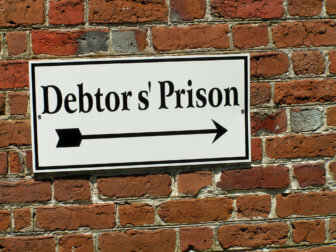 Confronted with an accumulation of fees and fines associated with both felony and non-felony convictions as well as unpaid tickets and other civil penalties, they wind up behind bars in what amounts to a 21st century version of debtors’ prisons. The large numbers of individuals victimized by what is sometimes called “cash register justice” are among the reasons why jail populations are overflowing in many American communities. And the costs are enormous: Fines and fees imposed by local justice systems around the U.S. drive unemployment, family instability, recidivism and poverty in the most at-risk communities. Just as problematic: Two-thirds of all prison inmates have criminal justice debts, which complicates their successful reintegration into the community. The onerous burden of justice fines and fees is often obscured by media and policymakers’ attention to other areas of justice reform. As a result, the dearth of consistent, informed reporting on this issue has helped to keep the costs, and their consequences, hidden to many Americans; and it has created a troubling gap in public understanding of the current state of our justice system. 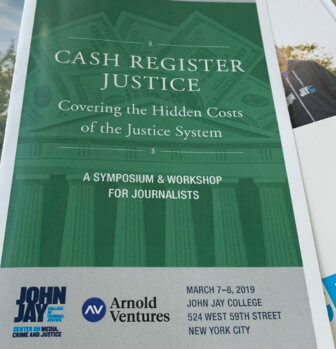 The Center on Media, Crime and Justice (CMCJ) at John Jay College, with the support of Arnold Ventures, formerly known as the Laura and John Arnold Foundation, is organizing a two-year program of media training for U.S. journalists to help fill that gap. The first round of the program, on March 7-8, 2019, brought together 21 journalists with elected policymakers, researchers and practitioners who have special expertise on the issue, along with individuals who have been impacted, at John Jay College. Their names and affiliations are below. A second round is scheduled for Sept 26-27, 2019, and applications for Fellowships will be available in May. Speakers at the first conference included Joanna Weiss, co-director of the Fines and Fees Justice Center; Marc A. Levin, vice president of criminal justice policy at the Texas Public Policy foundation; Nusrat Choudhury, deputy director of the ACLU Racial Justice Program; and Anne Shuhldreher, director of financial justice of the City and County of San Francisco. The agenda for the conference is available here. The Cash Register Justice Fellowship is one of a series of programs aimed at promoting and developing evidence-based reporting on emerging justice issues, organized through year by the CMCJ.